Every girl wants to look like a million bucks - so get all glamoured up this Halloween and really act the part! 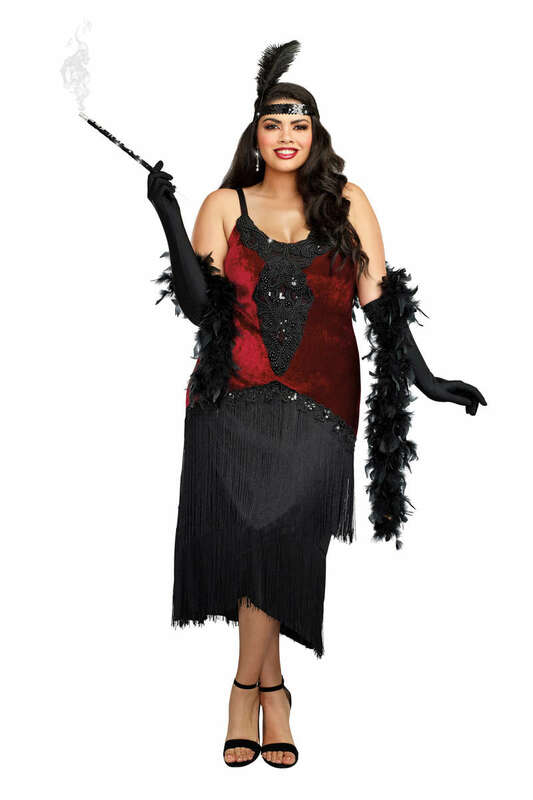 The Million Dollar Baby Women's Costume, shown here in our plus size version from Dreamgril, features an elegant, burgundy stretch velvet dress with authentic 1920's beaded trims, fringe hem, and sequin detailing. This two-piece costume set also includes the stretch sequin headpiece with ostrich feather. The gloves, jewelry, and cigarette holder are not included. To properly care fo your Million Dollar Baby Plus Size Women's Costume, the designer highly recommends that you hand wash separately from other garments. Foxy Lingerie offers this lingerie style in standard sizes as well. This item is proudly designed and manufactured by Dreamgirl. There are no reviews yet for Million Dollar Baby Plus Size Women's Costume. You can be the first to write one!